The dining space of your home is a mix of your kitchen and dining room – a place of relaxation, conversation and enjoying meals. 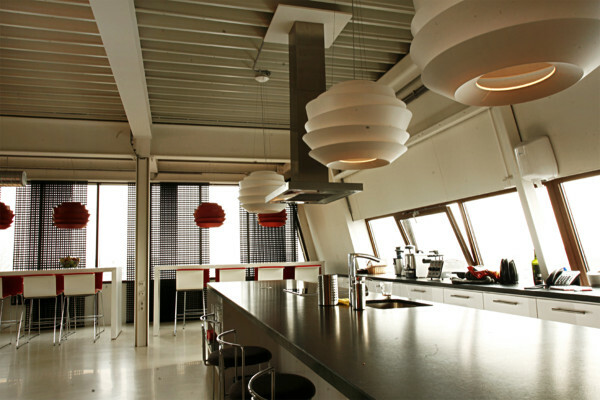 Whether you have a vast feasting table or a breakfast bar, there is a proper way to light it such as to enjoy not only food, but also design. 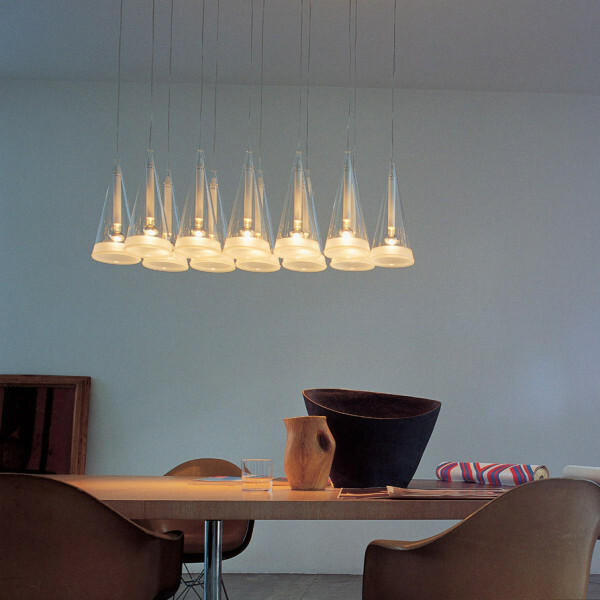 The two best ways to go is choosing a large pendant lamp, or a cluster/row of smaller ones. 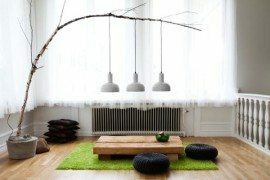 They can be hung really low, such as to become part of your dining table layout. The dining table lamp just has to be installed in such a way that one cannot bump their head into it – and it doesn’t blind people with glare. Let us see some beautiful choices. 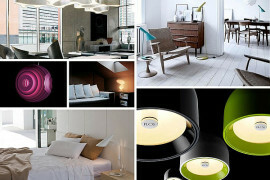 Cloud is one of the most popular Belux products. 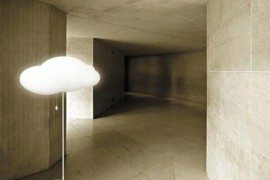 Designed by the famous architect Frank Gehry, this beautiful, light and airy lamp comes in various sizes. 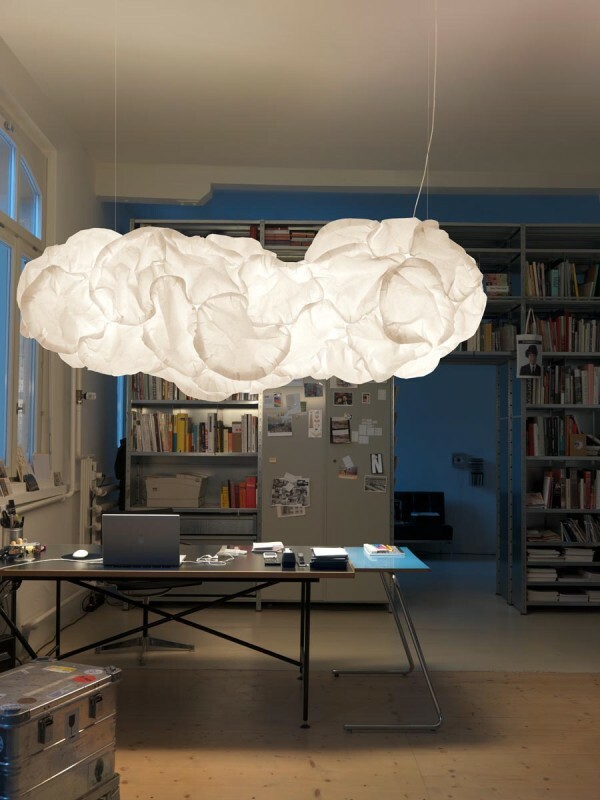 It is also available in smaller globe shapes, but the vast canopy named Mamacloud is the most impressive. 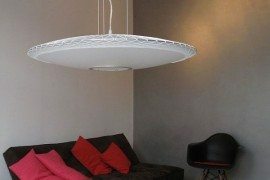 A very original and beautiful lamp, it has the surprising advantage of sound-softening quality and of covering –and hovering- over a large part of your dining room. 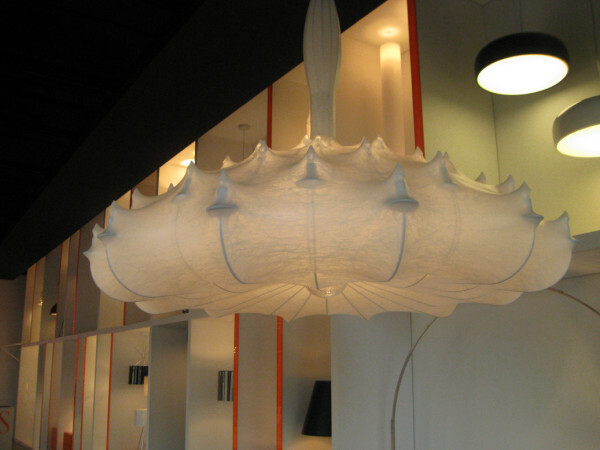 A creation of Marcel Wanders for Flos, this extravagant pendant lamp draws its inspiration from a thick spider web covering a torchere style chandelier. 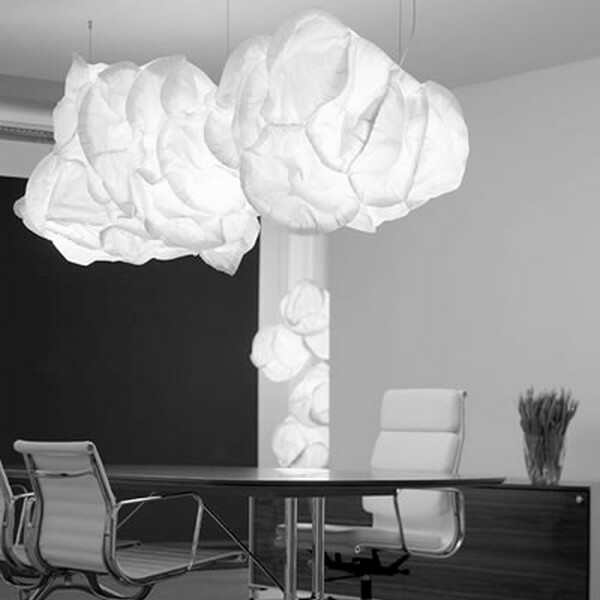 Much like the previously described Mamacloud, it covers most of the dining table and is suited for a round one as well as a rectangular one. 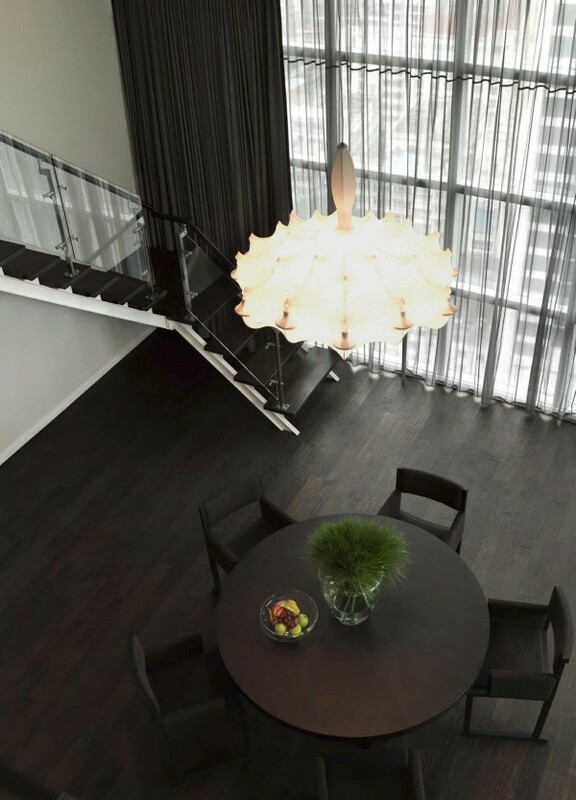 Light and refined, it could be seen as the modern, minimalistic re-interpretation of the precious chandelier, with an imposing presence in the dining room. 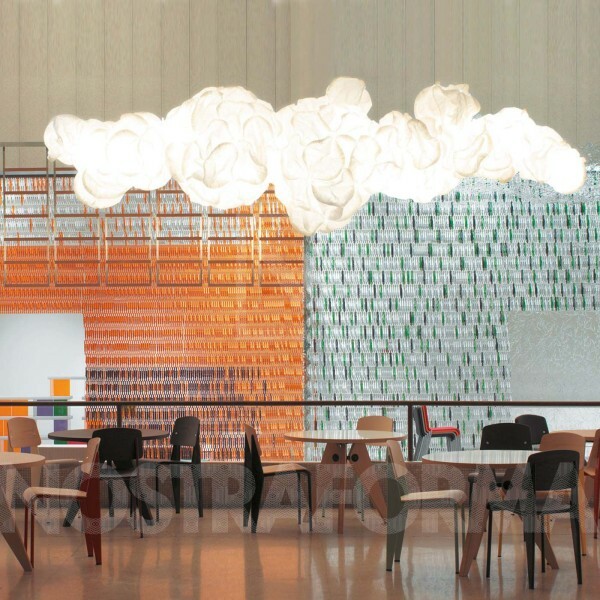 If you would rather go with subtle, consider these cute pendant lamps designed by Diego Rossi and Raffaele Tedesco for Luceplan. 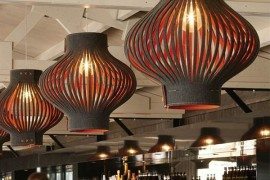 They work very well over the dining table, hung in clusters at different heights over a round table or disposed in a row over the breakfast bar. They come in slightly varying sizes and shapes inspired by fruits and flowers and with 3 color filters – red, yellow and blue. With their soft interplay of transparency, reflection, refraction and color, the Agave bring a fruity, tropical touch to the dining table. The precious style of lighting house Catellani and Smith shines fully through this beautiful pendant lamp very suited for a dining table. 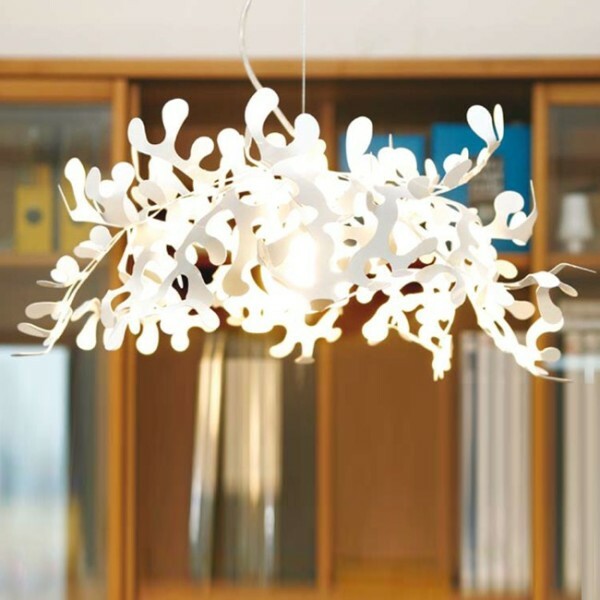 The organic, cowrie-inspired shaped is simplified and refined, covered in gold or silver colored plating. 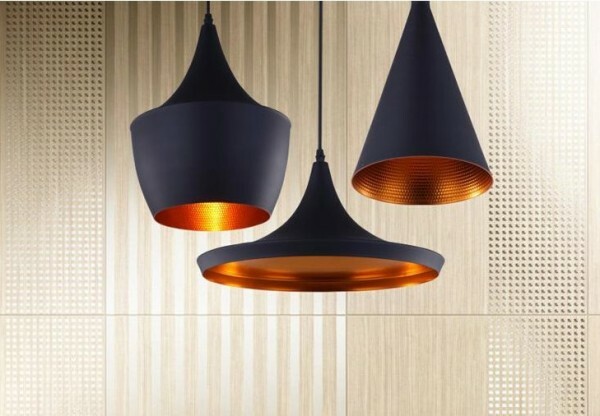 The texture of the shade is opaque and softly corrugated, thought to reflect other light sources in the room, while its own golden light is concentrated upon the table surface in an intense“light isle”. Gorgeous, original and elegant, nothing less expected of prestigious Catellani and Smith. These pendant lamps designed by Achille Castiglioni for Flos in 1996 are discreet, elegant and glistening like upside-down champagne glasses. The lower rims are sand blasted, so the eye-catching effect of sparkle and transparency is achieved without glare. 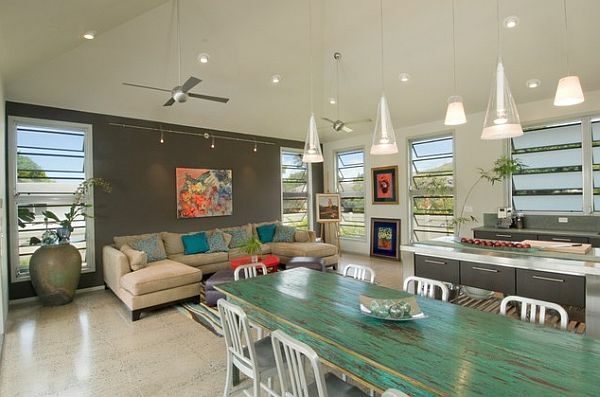 Hang a group of 3-4 in a row over the breakfast bar or an irregular cluster over a round dining table. 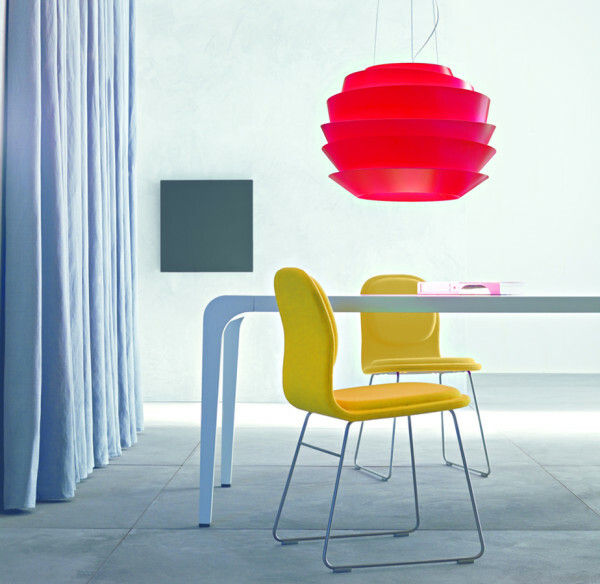 A lamp for fashionistas, Le Soleil by Foscarini is suited in a semi-minimalist and trendy dining room with flashes of colors here and there. 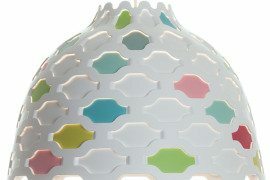 The synthetic shade, available in hot pink, white and turquoise, is wrapped around the light source and has a slight transparency , which gives off indirect light effects through, a very neat effect in addition to the actual lighting and the joyful appearance. A creation of Vicente Garcia Jiménez, inspired from the Guggenheim Museum in New York, Le Soleil exudes cosmopolitan taste and joie de vivre. 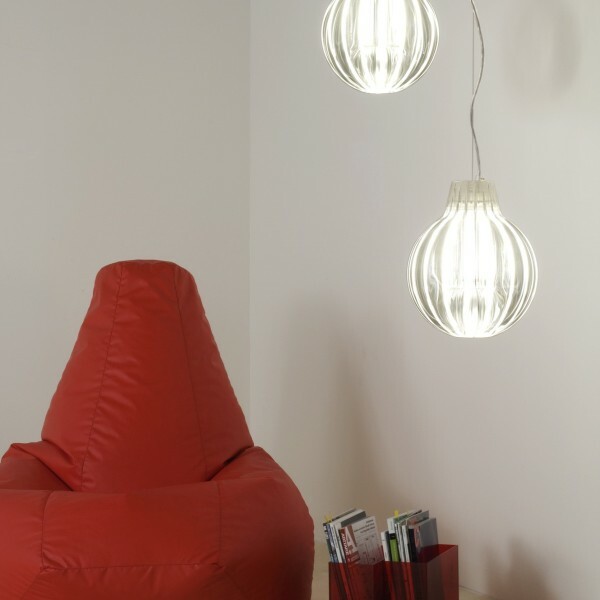 The popular and beloved pendant lamp is designed by Ferruccio Laviani for Italian design label Kartell. 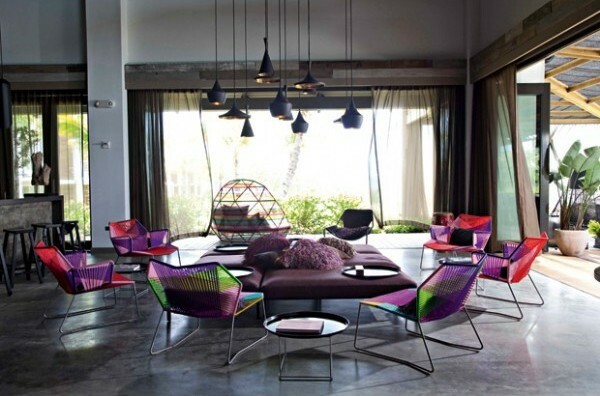 The shade is a transparent and colorful cut sphere reminding of soap bubbles. It convinces through its many joyous and modern colors – red, pink, blue, orange, violet, green – and its surprisingly convenient price. 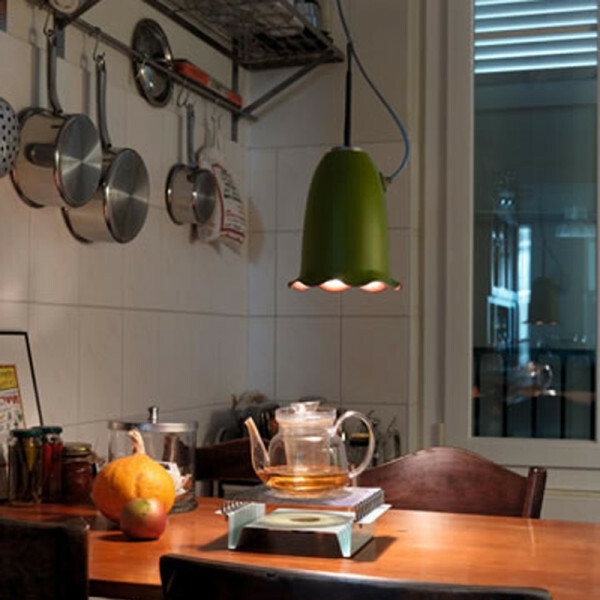 Suitable to be in a practical, light and modern dining layout in a row of 2-3, Fly Icon is a lamp for every taste. 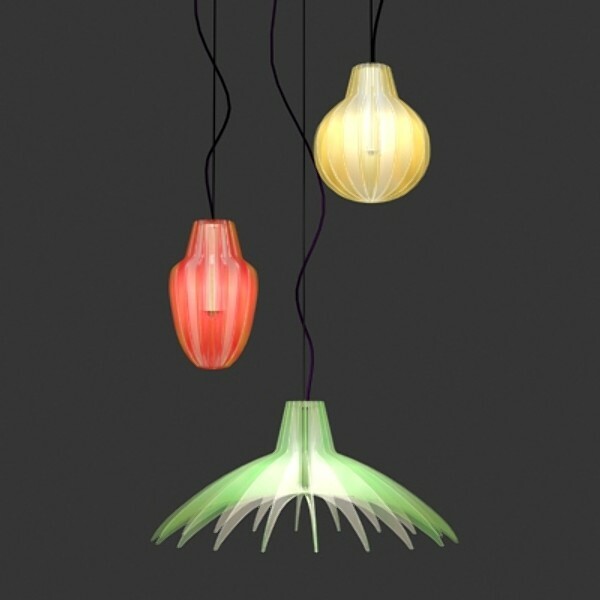 A rather young creation, the Blossom series was designed by Hella Jongerius for Belux in 2007. 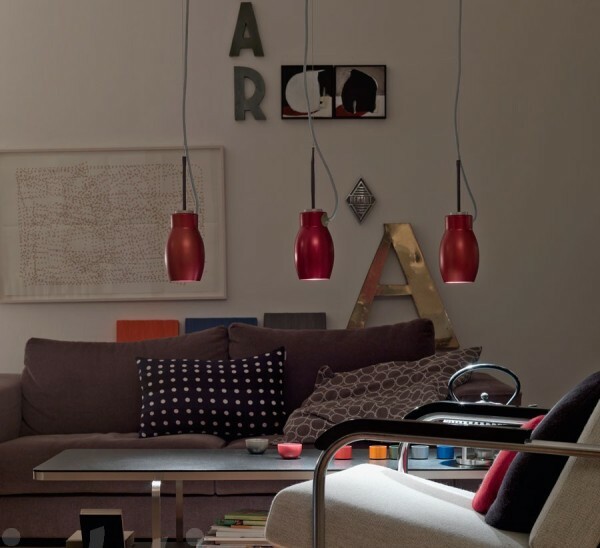 The surprising thing about these simple, recipient-shaped lamps is that, depending on which one of the 16 colors they come in, they fit in almost any dining environment you can think of. 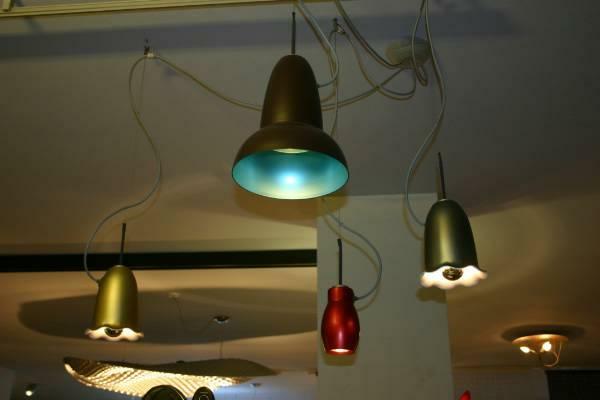 The shiny metallic shades have many pastel hues for light modern layouts, but also earthy colors for a retro environment, and the lamp is not feminine by definition, which, let’s face it, most of the beautiful and artful lamps are. 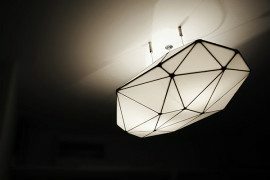 What I like a lot about these lamps, in addition to their versatility, is the fact that the feeding cable has a significant visual role in the ensemble. 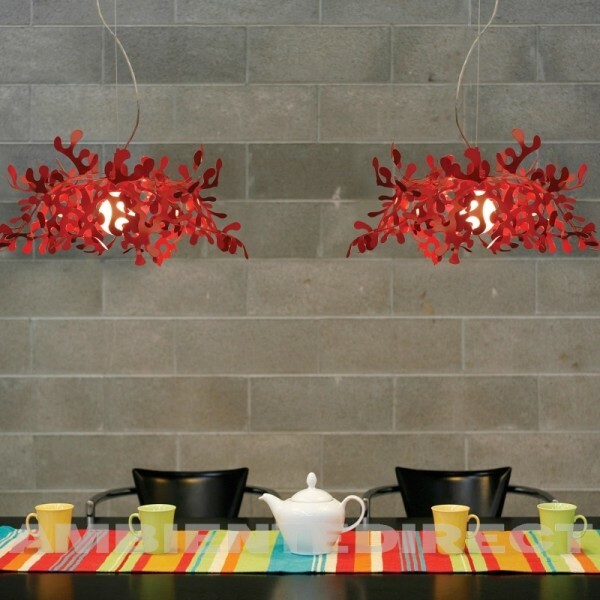 The Blossom lamps work wonderfully suspended in a cluster over the table or disposed in a series, and moreover, you can take the theme into the kitchen too, since their concentrated light bundle is very practical for lighting the work surfaces. 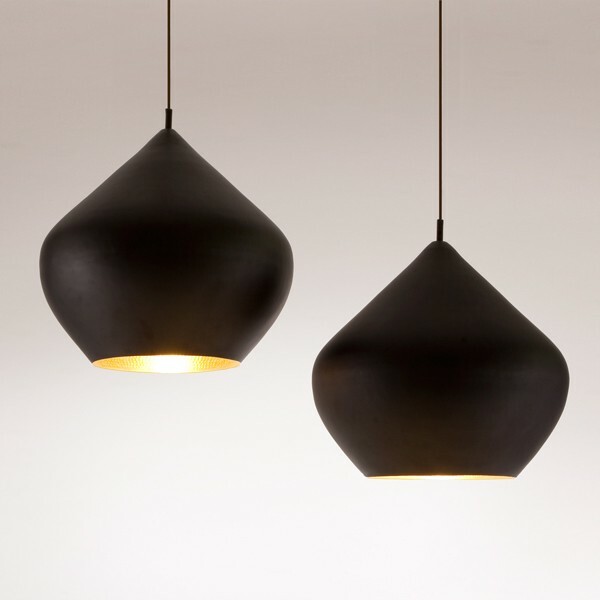 The pendant lamp by British industrial designer Tom Dixon is gorgeous, elegant and masculine and comes in three cup-shaped versions – fat, tall and wide. The absolute best option is to use all 3 of them in your layout. The refined touch is conveyed by the matte black lacquered exterior combined with the golden interior which reflects and enriches the light. Hung in a cluster for vivid asymmetry or in a regular series for a very graphical and hieroglyphic impact, they are essential, modern, concise and visually very catchy, with just a slight amount of eccentricity. 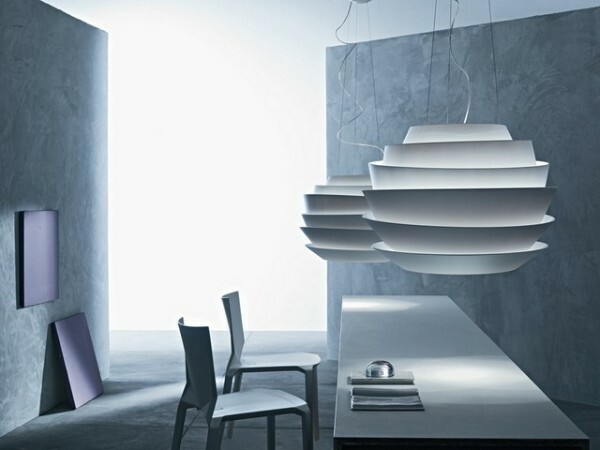 This creation by Villa Tosca Design for Slamp, is another example of light and airy presence over the dining table. 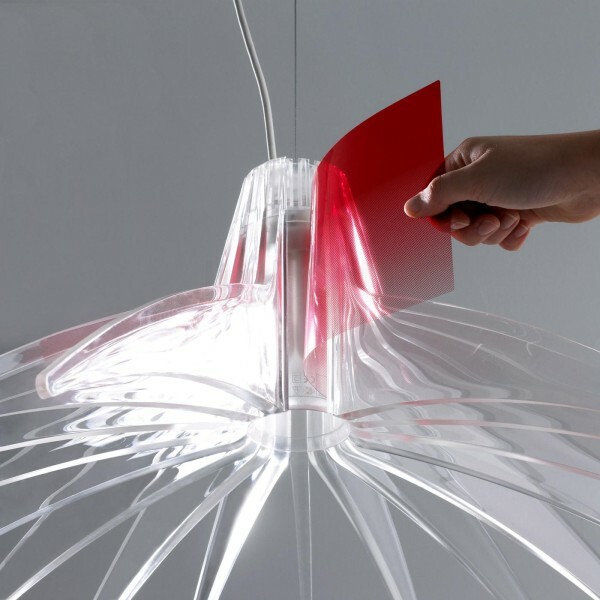 The stylized shade in red, green or white, inspired by vegetation forms, surrounds the light source like a nest of delicate paper cut filtering the light indirectly for ambient effects. 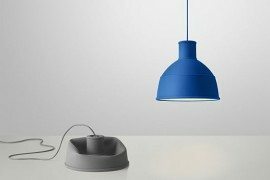 It is a neat, original and convenient designer lamp, which adds refinement and extravagance in a light and purist to slightly retro layout.